Toddler Activities: A Pretty Card Holder for Valentines or Customize to Suit any Holiday. 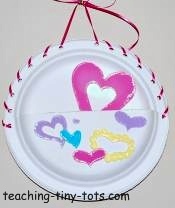 A simple design using paper plates and your child's imagination. Great for displaying and collecting Valentines cards from relatives and school. Easy class project and simple to change the decorations to coordinate with the holiday being celebrated. 2 Dixie Plates or Sturdy plain white plates. Glue plates by lining up edges and top side facing together. Let dry. Punch holes about an inch apart on the top half of plate or around the entire plate. Cut two pieces of ribbon or yarn. Weave through left set of holes leaving about 4-5 inches at the top. Repeat on the right side. Tie the two ends at the top in a bow. Tie with a couple inches to hang. Decorate by sticking on foam hears. Add glitter glue for some sparkle. Dixie white plates are sturdy and easy to work with. Styrofoam may break easy when punching holes and stringing with yarn. For a young toddler you can use one long piece of yarn or ribbon...start on either right or left and just leave a loop at the top and continue weaving to the other side. hearts cut out of construction paper. Perfect for day care or elementary school. 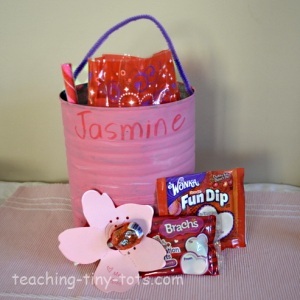 Use a coffee can and decorate to make this simple "green" valentines treat holder. Great for goodie bags, cards and projects for each child to take home!